Jordan Pruett was raised in a small town on the outskirts of Princeton, WV. He attended Glenwood School until 2005. There he started his involvement in community service organizations. As a member of Jr. Civitains and 4-H, he learned what it meant to serve others. His love for broadcasting started when he was in middle school and started watching the news every day. After a while his interest started to focus on being a meteorologist. Jordan started his freshman year at Princeton Senior High School already signed up to be in Key Club, the largest high school community service organization in the world. He took courses in Journalism and Business Communications and read the daily announcements on Tiger TV (the high school's TV network). While in high school his focus on meteorology turned into a dream: he had the opportunity to be a Weather Center Intern at WVVA. This internship was vital to his career choice because he learned how a newsroom ran and operated, what went into a newscast, and that broadcasting was the job for him. He graduated from Princeton Senior High School in 2009. He headed to Penn State in the fall of 2009. While there he served as treasurer of the Residence Hall Council and began his membership in THON -- Penn State Dance Marathon -- which raised money for pediatric cancer research and paid for hospital bills of patients at Penn State's Hershey Children's Hospital. From there he became a Resident Assistant in the Residence Hall on campus and became active on the campus Safety Committee. 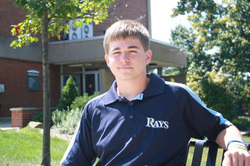 In the fall of 2012 he joined the Centre County Report, an award-winning student newscast. There he was an anchor, a reporter, and an audio board operator. During his time with CCR he wrote, recorded, and edited stories as a one-man-band. Jordan is a current Senior at the Pennsylvania State University majoring in Broadcast Journalism option Communications and minoring in Youth and Family Education. He is the Executive Producer of the Centre County Report and is overseeing a 20 person news staff. His aspirations after graduation are to work in the journalism field as a news reporter and/or anchor.